Plants are known to bring life and movement into our interiors, but it is no use having the plants, but not knowing how to take care of them. 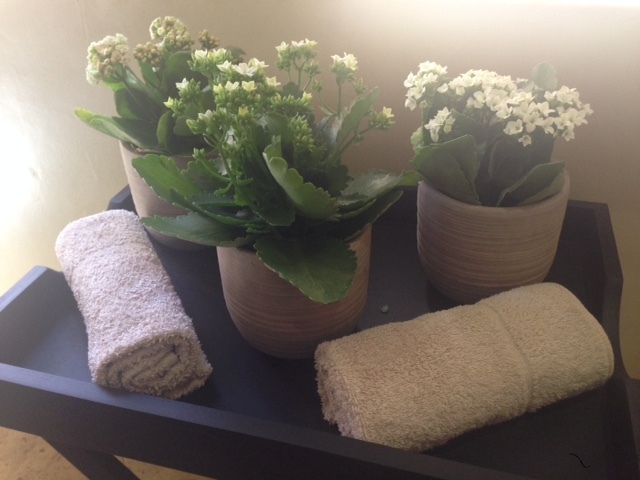 – A plant with flowers will generally live in your home for 4-6 weeks. Once the flowers have died, simply cut them off and decided whether you want to leave the plant indoors or plant in an appropriate area outside. – When it comes to watering, make sure that your plant isn’t standing in water. Rather water plants in a basin or in the bath and allow to let the water drain out, before placing your plant back into its pot cover or position. – Some containers have a little well built in, ensuring the plant doesn’t sit in water. – Indoor plants need to be thoroughly watered once every ten days (not more, not less). – Very important to feed your potted indoor plants. Whether through a liquid fertilizer or growing sticks, be sure to follow the instruction on the relevant product, and your plants will be healthy and strong. 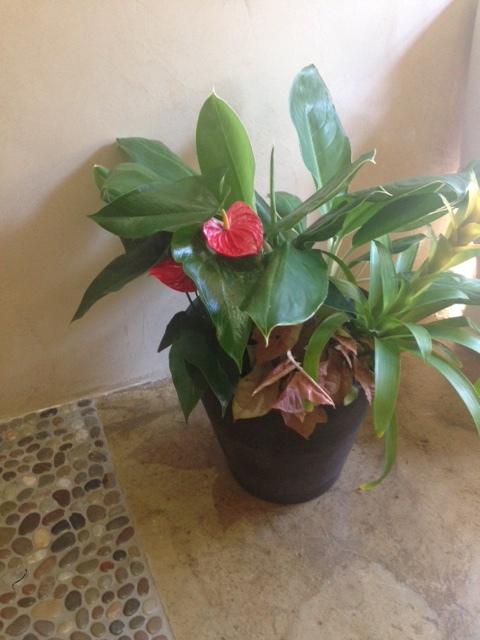 Start by placing your Philodendron in the back of your pot. Add a Gazmania and start filling the bigger cavities with potting soil in preparation for the smaller plants. 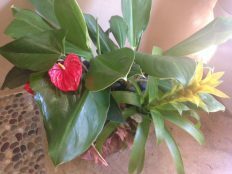 Add an Anthurium to the pot, and continue to firm the soil around your plants. Place a Syngonium “neon” in the front of the pot and fill the pot with potting soil. Finish off by placing a layer of moss, bark or pebbles and give a thorough watering. Taking care of your bathroom is detrimental to your personal well being, as mould or standing water can affect your health. A neat bathroom is also a welcoming one, so knowing how to put up a towel rail is a must. Inspection for cracks or loose silicone that requires repair and/or replacement. Remove old silicone using a metal blade and clean area allowing sufficient drying time. Apply masking tape to cover areas you don’t want silicone applied to. Use a caulking gun and bathroom-specific silicone to apply in desired area. Remove the masking tape while silicone is still wet. Allow silicone to cure for the recommended time (relevant to product). Grouting: remove old grouting and replace with new colour-matched grouting. Ceilings, shower stalls and bath tub surrounds can become affected areas. Using gloves, remove mould from affected areas by either scraping or wiping with mould treatment and allow to dry. For new ceilings, apply paint with build-in fungicide. To treat older ceiling, apply paint once the area has been treated and mould has been removed. 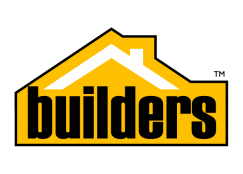 TIP: A general rule of thumb for buildings up to code, is that plumbing pipes usually are situated from the ground up in single-storey homes and in line with the basin, shower or toilet systems. Using masking tape, mark out where you will drill into the wall to secure your bathroom accessory. Masking tape will help prevent the drill bit from slipping and avoid tile splinter. Start the drill off slowly to create a groove before allowing a gradual increase in speed to the desired depth. TIP: Place masking tape onto the drill bit at the desired depth you require. This will easily help indicate when to stop drilling. Insert a plastic wall plug that will receive the wall screws and secure your bathroom accessory safely. 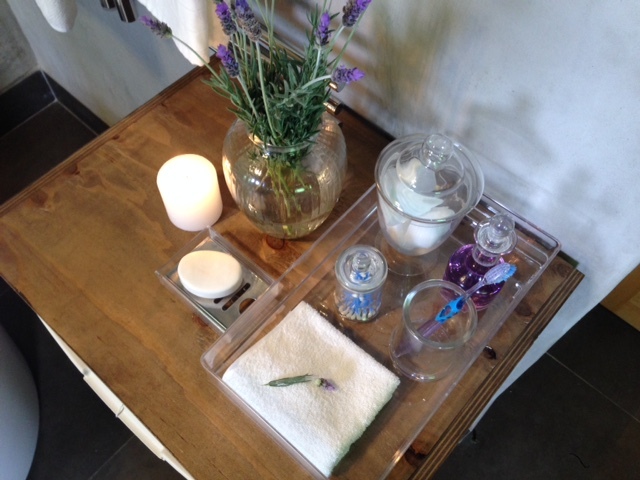 Décor in a bathroom is essential as it helps to warm up an area known to have cold, hard surfaces. Adding a stylish laundry organiser, not only neatens your bathroom, but also provides a surface to add bathroom comforts. 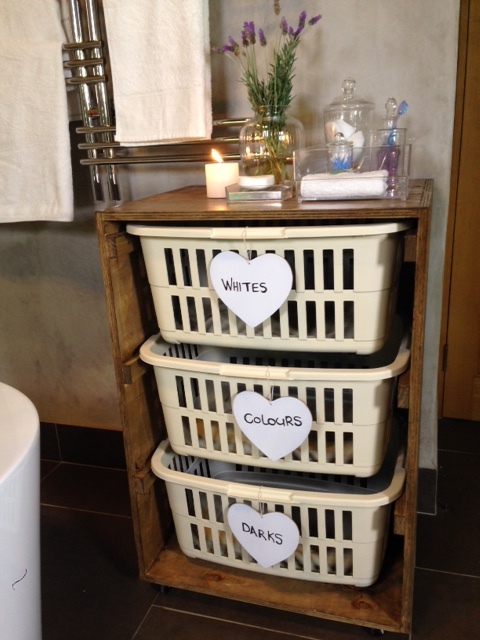 A three basket laundry organiser is a must if you enjoy a well organised bathroom. With enough room to put your personal spin on this project, let your creativity go wild and make laundry day one to look forward to! Measure the length, width and height of your chosen plastic baskets as they are what the wooden box frame centers around. Write down the measurements and then get your plywood pieces cut to size. To pay it safe you can always add on an extra 5mm to give your baskets room to breathe without altering the end project drastically. See how the pieces of plywood fit together to form the wooden box that the baskets will fit in. There are two options either securing the side panels to the sides of the base and top or the top and base securing to the side panels. In this project the side panels where secured to the sides of the base and top using long wood screws. Mark out where the sides of the top and base will be secured to the side panels, by placing the top/base piece of plywood perpendicular to the side panel, making sure all edges are flush and straight and then run your pencil along the edge –marking it out. This is now the marked off space that guide you as to where you can drill your pilot holes without standing a change of the wood breaking out. Mark out where pilot holes will be drilled. Place the plywood on top of some scrap wood to ensure protection of your work surface and to stop any splitting of the wood. Drill pilot holes using 4mm wood drill bit. Now that the pilot holes are done and the area of where the top and base fits marked out, you can measure out the remaining lengths of the side panels for the cleats to be drilled in. These “cleats” act as the ledges that the edge of each basket rests on making a drawer like structure. Each basket was measured at 270mm in height and there are 3 in total. Taking into account that a 10mm gap is needed between each “drawer ledge” or cleat to make sure the baskets are not close together. Make a marking of where to secure the cleats at every 280mm down the length of the side panels making sure to not go over the markings of where the base and top will fit later on. Secure the entire wooden box structure together, lining up the cleats on either side and securing long wood screws into the pilot holes with a cordless drill and driver bit- use long clamps or get an extra pair of hands to help hold the wood flush and straight while driving in the wood screws. Sand down the rough parts of the plywood using and orbital sander and sandpaper discs starting off with 80grit and finishing off with 180 grit for a smooth finish. Optional step- Paining or staining the wooden box frame of the laundry dresser will make the project look more polished and you can choose a colour that matches the interior space of where your project will be placed. Optional spray painting of the plastic baskets, if the original colour of the plastic baskets is not an ideal colour for your finished look you can change it up by using a spray paint with a built-in primer for plastic material and allow for the full drying time before using. To limit the scratching of the plastic surface a clear matt or gloss spray sealant can be applied over the spray paint colour. Dress and style your laundry organizer and make use of cute wooden plaques to label the different baskets.